Looking back, I did some things I never imagined I would do. I flew shotgun in a tiny plane taking Jessica Schulze, CEO of Pivot Rock Solutions, and me to Tortola in the British Virgin Islands. I raced a sail raft in the Caribbean Sea to Mosquito Island. We slowed down only long enough for Sir Richard to jump on, and then playfully push, European Wax Center franchise developer Karen Bentlage into the water. I danced on a table in glowing LED clothing. I flew high when I tried kite surfing, and I plunged deeply when I jumped off a cliff. These exciting experiences inspired me and pushed me to go further. Despite the demands of running a business and making it successful, there can be balance. Sir Richard stressed the importance of balancing all aspects of your life: work, family and leisure time. For women, it’s not always easy. Many of us are told we can’t “have it all” and be a mother. Well, I’m living proof that it’s not only possible, it’s gratifying! It is true that some men cannot handle a woman winning. But I love it when men and women harmoniously work together to achieve goals. I watched my grandparents run a business together for more than 50 years. In my own case, when people told me I couldn’t do something because I was a girl, it made me try harder to prove them wrong! 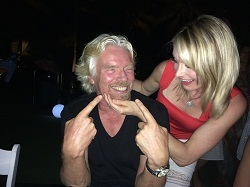 Another person I met on Necker Island is a champion for women entrepreneurs. The wonderful Jo Burston has started the Rare Birds initiative to enable women around the world to become entrepreneurs. Jo said that when she recently traveled around Australia and asked schoolgirls what an entrepreneur was, most of them didn’t know. The ones who said they did know answered, “A man.” She told me, “From igniting passion in the young, to helping aspiring women entrepreneurs overcome the unique challenges they face, Rare Birds will challenge the existing cultural values and attitudes hindering growth in our global economy.” She also pointed out that the power to create jobs is cut in half if women are not actively engaged as entrepreneurs. Women can and do create jobs. Time to harness that energy! Jo will be partnering with Sir Richard’s Galactic Unite team to support and nurture future women entrepreneurs. That attitude of empowerment is, without a doubt, a high priority with Richard Branson. Not only does it allow employees to be their best, but it also allows you to confidently delegate to them. Then “get out of the way.” Allow people to succeed (or fail and learn safely) on their own. Well, I will cherish my time on Necker Island like nothing I’ve ever known. It was the biggest trip of my life. Thankfully, Scott MacDonald, President of Noise Solutions, served as our personal photographer, so the memories of every zig and zag will last. And Dione Spiteri, the prosperous businesswoman who brought us together for this unique experience, knows so much about the Traction model, we know where to come for guidance.